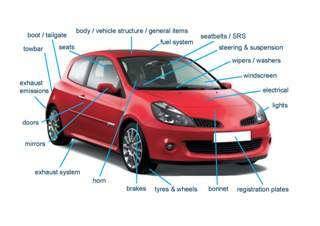 It is the vehicle owner / drivers responsibility to ensure that the vehicle is kept in a legal road roadworthy condition at all times. The MOT test checks that vehicles meet road safety and environmental standards. The first MOT test for a vehicle is required when it’s three years old, Then annually after this date. There are different rules if it’s used as a taxi. Condition, security, tyre size and type and tread depth. Spare tyre’s are not inspected. Note: vehicles first used on or after 1 January 2012 – check of the MIL for tyre pressure monitoring. MOT test stations have designated test bays where they conduct the test, using a range of equipment that meets the required specification for MOT testing. The standard test procedures are laid out in an inspection manual that the test station should make available on request. You have the right to view your mot being carried out from a designated viewing area if you so wish. You can rest assured that at Inline Garage Services we will only charge a price relative to the time taken to perform the test to ministry of transport guidelines. We will not quote a massively reduced price to carry out the M.O.T Test only to then find additional work chargeable to yoursleves our valued customers just to make the money up.